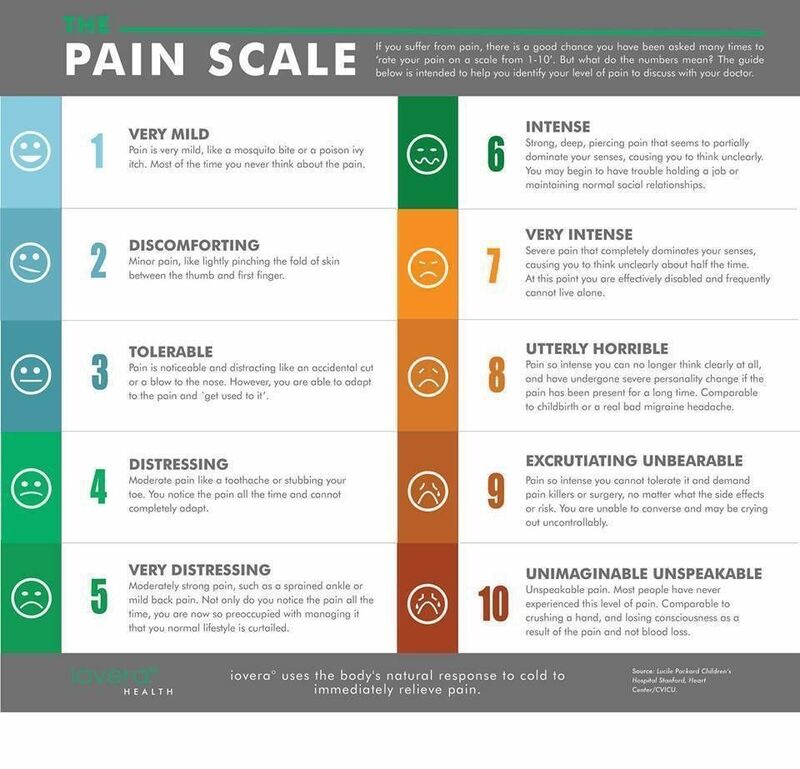 I have and I am very sure all of us hear have seen many diffrent versions of 1-10 pain scales. I found one I particularly like and carry with me in my emergency medical files. I attached it hear if you can read it. To me a pain of 10.0 is black out. The body can no longer handle anymore pain so it shuts down to protect its self. I have had many 10.0 were I have simply blacked out from pain. My pain started at age 14 with JRA. My pain tolerance is faily high. But I think we all can agree if we have a pain breakthrough of say 6-7 on the pain scale for say a week. Well. We just go nuts and it becomes a living hell 9.9. I have a lot of friends not in pain asking is it really that bad? I tell them to find a pea sized irregular rock (not smooth... Has jagged sides) put it in your shoe and wear it for a week and never take the shoe off or reach down to adjust it. Sometimes you don't feel it at all. That's a great day! Other times it's an anoyance and hurts and can't do anything about it and drives you nuts. And it's only for a week. Think about that for months... Years... Decades. Then there are times it's just right and you step and it sends you straight upwards in sharp pain. Some times for a while... Hours even. Few have ever tried it. The few that have have came back and given me a big hug and apologized profusely for being a jerk. They said they can't fully understand but have a much clearer idea of what we go through. For they could always take the little rock out... We Can't. Looking for it. It has been a few years. If I find a link will share it hear. Here is the link for. The pain scale on the net. Thanks so much. It truly clarifies the issue. Now to print a copy. My phone doesn't want me to print this off. I'm glad to help. I hope you can print it off. I take it with me and tell the ER I go by this pain chart not there silly one. Thank you for the link Overcomer!